A cemetery is a repository of remains of those gone before us and a repository of individual stories. Tombstones provide insights and can spur our imagination about individuals related to us that we never knew. Cemeteries beckon us to consider life while contemplating that we all have an expiration date. 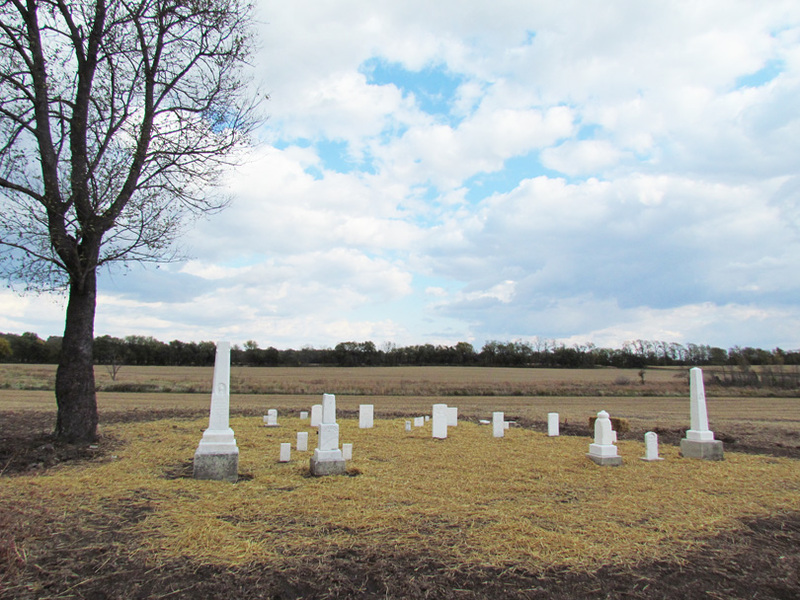 Cemeteries are special places.This is a story about the loving rescue and repair of a family cemetery in Mount Ayr, Newton County, Indiana, by caring descendants of those buried there. The dedication and drive of the successful rescuers of this special piece of land offers a compelling story of connections with the past. 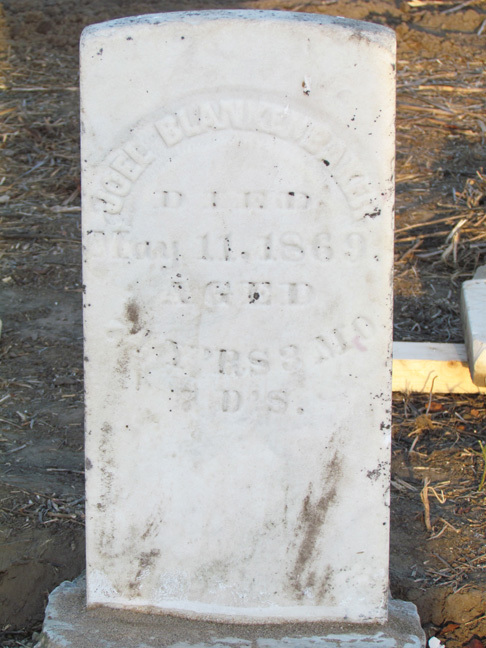 Fortunately for the descendants in our story, a farmer who purchased the farm on which the cemetery is located had checked the records at the courthouse to determine the exact size of the burial plot and had cleaned it up. A previous owner had allowed his cattle and pigs to graze in the cemetery causing damage to the tombstones. 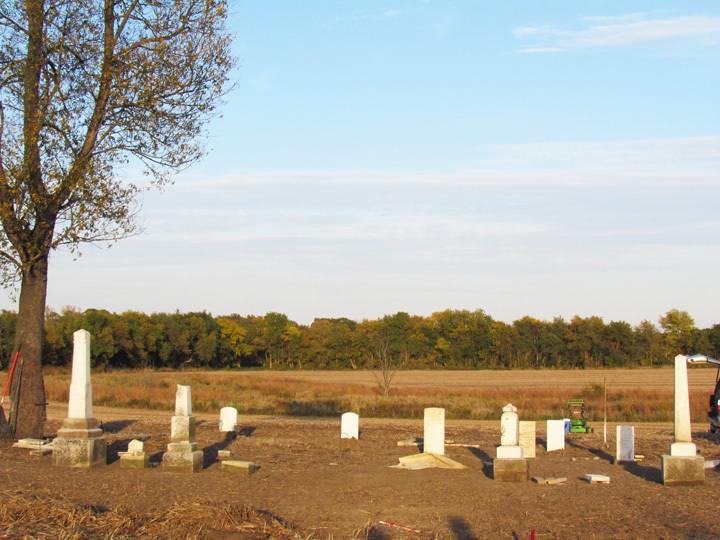 In the photo on the left taken early in 2010, descendants visited the cemetery with the permission of the owner to determine what work needed to be done. Many of the stones had been trampled into the ground by free-ranging farm animals; other stones had been broken into several pieces. There were very few grave stones still standing. 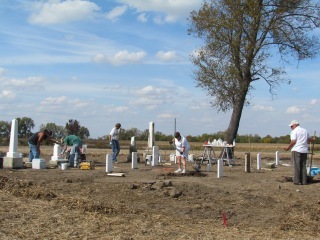 A professional cemetery restoration team came to the rescue as the repairs needed were extensive. First the underbrush was cleared from the plot in order to make it easier to locate fallen grave stones and to permit probing to locate those stones that had been buried. 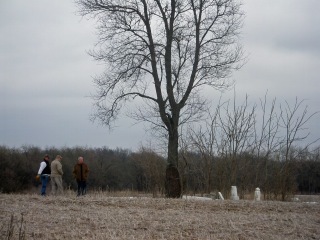 By October 2010, the descendants and the professional cemetery restoration team were ready to begin the real work. The farmer harvested his crops and gave them permission to access the cemetery. 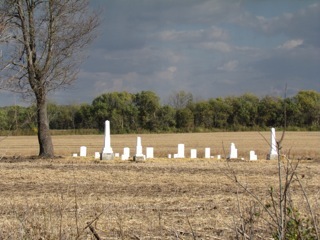 The farmer declined to deed the descendants the cemetery plot, but did grant them permission to access the cemetery at any time, asking only that they not damage the crops in the field. As the photos above so aptly illustrate, there was a tremendous amount of work to be done. Buried gravestones were dug out, then placed on their bases. Dirt and mold were removed to reveal the data contained in the inscriptions that speak to us about the individual's time on this earth before they went into the earth. 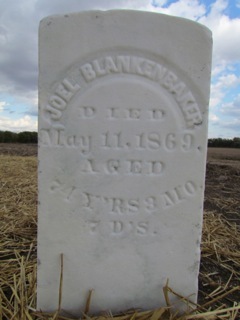 On the left is the grave stone of Joel Blankenbaker, son of Lewis Ludwig Blankenbaker and Susanna Utz, before restoration. The photo on the right shows the gravestone after cleaning. 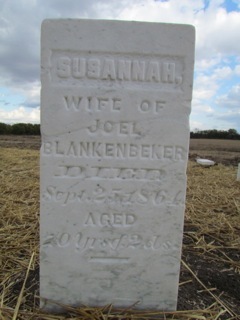 Susannah House, daughter of Michael House and Susannah Zimmerman, was the wife of Joel Blankenbaker. Her gravestone was broken in pieces as shown in the photo on the left. After it was repaired the break was barely discernible. Note the different spelling of the surname between Joel and Susannah's gravestones. 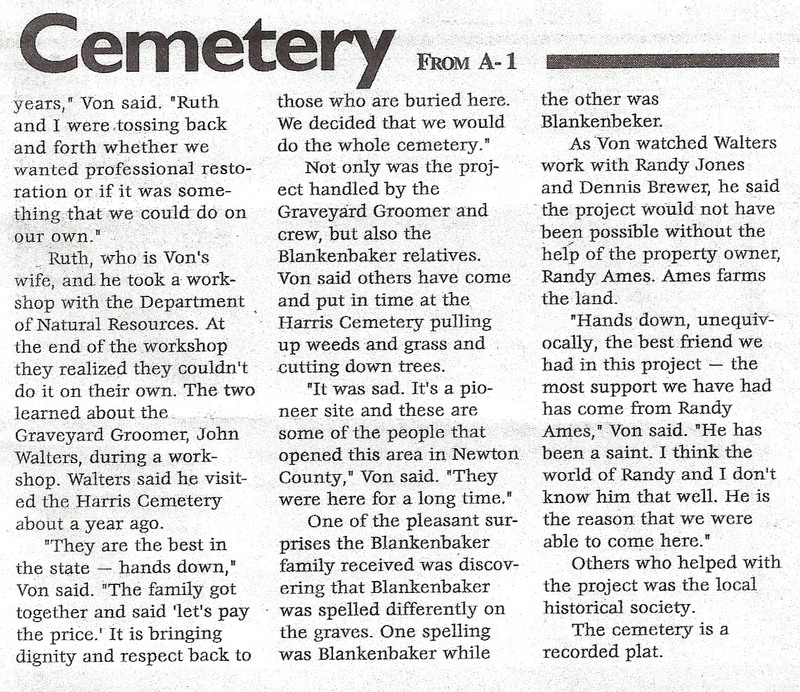 Hard work and loving care brought about the repair and restoration of the cemetery. 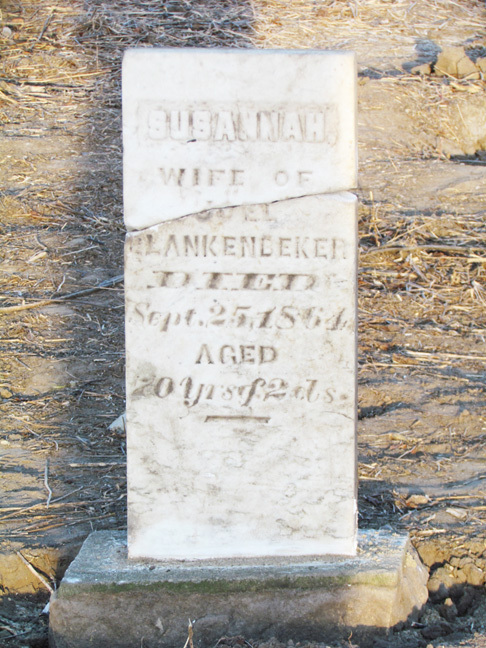 Through the efforts of the descendants, the land owner and the professional cemetery restoration company, the Harris-Blankenbaker Cemetery is preserved and cared for allowing the living to look back and contemplate the lives of those who now rest here. The newspaper article below appeared on October 18, 2011, in the Rensselaer Rupublican, a newspaper published in Rensselaer, Jasper County, Indiana. The information and photos in this article were provided to Germanna Research Group by Ruth E. (Brown) Blankenbaker and are published with her permission. The copyright for the photographs belongs to Ruth E. (Brown) Blankenbaker.